With my degree project I’ve explored an alternative, collective design process through a version of the game Chinese Whispers. The process is based on communication and interpretation of images and text between different people. 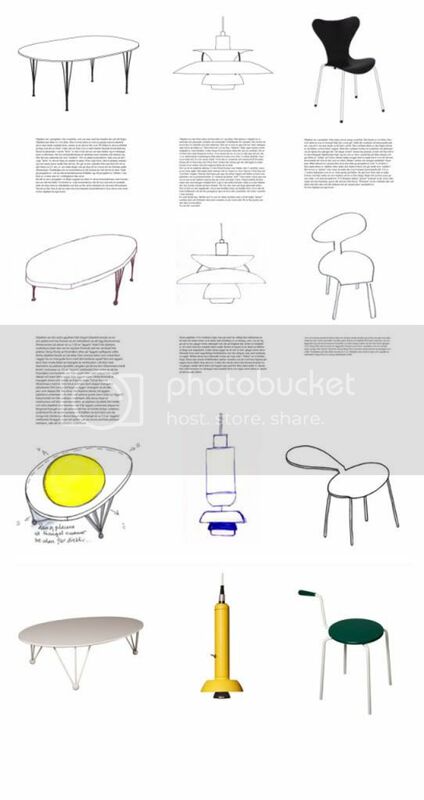 Through the process I’ve designed three objects; a chair, a table and a lamp whose individual origin is based on the images of some well known Scandinavian design classics. The participants in the project helped me with what normally would be my own sketch phase, and I was presented with material that I never would have come up with on my own. It was an exciting way for me to experiment and seek new information, new shapes and to continue my development as a designer. Step 1: The picture of the original product. Step 2: I describe in words (abstract, not giving away what it is) what the picture of the original product look like. Step 3: Person 1 draws a picture after my desciption as he/she interprets it. Step 4: Person 2 writes a new text describing the picture from Person 1. Step 5: Person 3 draws a new picture after the text from Person 2. Setp 6: I take the last picture and make my own interpretation of it and continue the design.